“To be honest this has been an amazing treat for me. The last time that I was in the states was 2000. 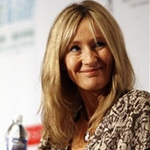 Things got a little bit unmanageable signing wise in terms of numbers who was turning up, but I really missed being able to interact directly with readers,” says J.K. Rowling. Among the many who were at the first stop of the Open Book Tour were two people who are special to us at Leaky: PotterCast’s own Bre Bishop (she of the very cool tour videos) and Rita Gill, and they were among those who got to meet our favorite author. Jo patiently signed copies of “Harry Potter and the Deathly Hallows” books for every one of the 1,600 young people at the event, and it proved to be an exciting and wonderful moment for the two longtime Harry Potter fans. Standing in line waiting to have their books signed, they described the scene noting that some of the children were dressed in their Harry Potter robes and all were all very excited, with even one youngster saying he dared another student to ask JK her real name. Bre told us of her meeting with Jo, describing the wonderful moment when Jo was autographing her book. Bre got to speak briefly with Jo, telling her how much the books had changed her life and what an impact they have had on her. Jo looked up and smiled making eye contact and saying thank you very much and that it meant a lot to her to hear these things. Rita was also very emotional during her meeting. In a very lovely and heartfelt way, Rita told of how she burst into tears upon meeting Jo, practically sobbing, telling her that all the friends she has right now are due to the Harry Potter books. Jo then got up and went over to Rita, hugging and comforting her, telling her not to cry. wow. If you are among those who met Jo today, or will meet her at the next two stops, please send in your story and any photos to [email protected] and we will post them. Congratulations to all who met Jo!